I’ve been a fan of the VIPOrbit contacts app for iOS since it first launched, but two things get in the way of its true potential—well, make that one thing now, thanks to vipSync. 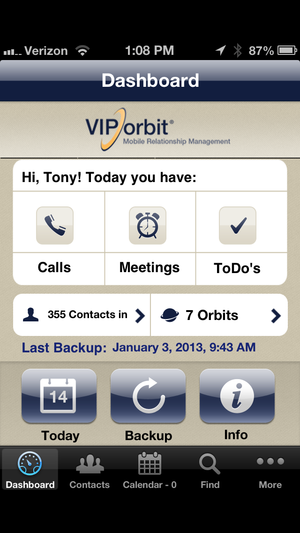 First, a little background on VIPOrbit: It's a relationship manager more than a contacts app. It allows you to maintain your contacts, classifying them into one or more “orbits”, and to track connections among your contacts. Just as I learned when using the Sage ACT database (which was co-developed by Mike Muhney, founder of VIPOrbit), VIPOrbit is only valuable if you actually use it. If you dabble in it here and there, it probably seems underwhelming. However, if you make it your primary contact, calendar, and communications hub, its ability to keep your life and calendar in order is impressive. vipSync keeps your iPhone and iPad VIPOrbit apps in sync. What are the two major issues with VIPOrbit? First, there’s no way to make it the default app for contacts, calendar, placing calls, or any of its other functions on your iPhone. Unfortunately, that's a limitation of iOS itself and unless Apple changes the way apps can interact with its OS, there’s no fix. In the meantime, making proper use of VIPOrbit requires more conscious effort because calls, texts, calendar events, and other relevant actions will use the built-in iOS apps by default. The other issue is that the iPhone app and the iPad app are both islands unto themselves. When I place a call from VIPOrbit on the iPhone, the iPad doesn’t know about it. When I add a new calendar event on the iPad, that information doesn’t show up on the iPhone. There are some convoluted workarounds to force the two to match, but the information really just needs to sync automatically in the background. VipSync is a new service offered by VIPOrbit that keeps the data on the iPhone and iPad in sync. One of the devices is designated as primary, but once you get vipSync set up it seamlessly syncs in the background so that your VIPOrbit app on the iPhone and iPad have the same, up-to-date data. One downside to vipSync is the cost: $4.99 per month, or $45 for a year. Also, VIPOrbit is not a dual-purpose iPhone-and-iPad app; there are separate versions for each device. Getting both apps costs $25 in the first place ($10 for VIPOrbit, and $15 for VIPOrbit for iPad), and then you’re looking at an extra $45 per year to keep them in sync. The cost of the apps with the vipSync service are a tad high by iOS apps standards, but not expensive enough to be a deal breaker in and of themselves. If you use VIPOribt properly you’ll get your money’s worth. The next piece of the puzzle is VIPOrbit for Mac OS X, which when it's released will let you use the same relationship management tool at your desk as on your mobile devices. According to Mike Muhney, when it hits the street it will also work with vipSync.